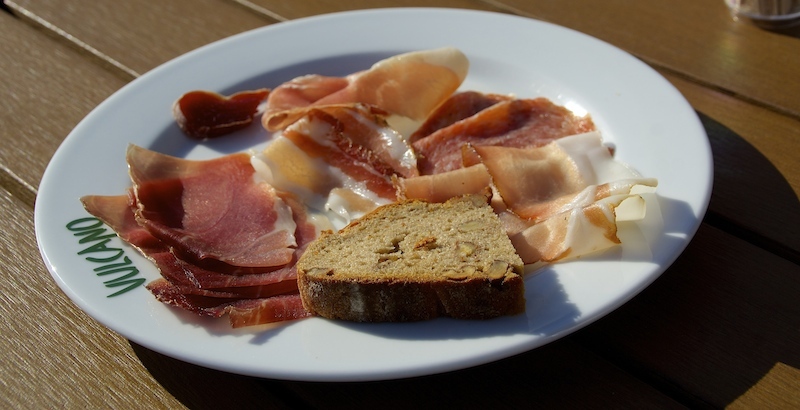 If you are wondering what ham has to do with classical music, I’m afraid you’ll have to come to Austria to find out! 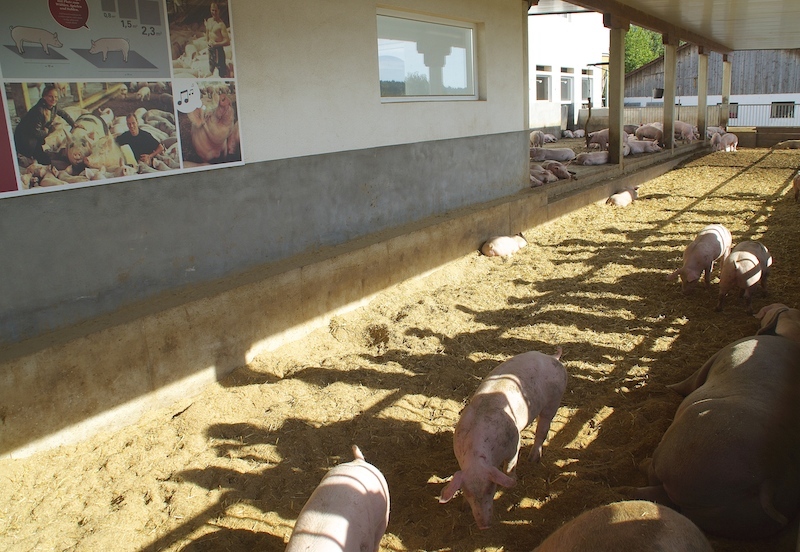 I admit I am not a big consumer of pork but when I heard about this farm in Styria’s Auesbach where pigs are bred in a special, respectful way, I wanted to see it for myself. Styria from where my husband’s family originates, is the biggest state in Austria and considered the green heart of the country. Its meadows, pastures, orchards and vineyards are what make this heart so special. It is also where most industries are located. Styrians are tough, resilient people, the older generation being more reserved and conservative. In the younger generation, there are those who leave to bigger cities like Graz and even Vienna. And who can blame them, a beautiful but unforgiving landscape of mountains where winters are the hardest there is. Villages are often isolated and job opportunities sparse. But there are those who stay. Some conform to the way of life, some transform old family businesses in something innovative and others in time create something unique inspired by old traditions. Vulcano became the dream of three Austrian farmers who in 2000 decided they were going to try and produce the best ham in the world. The basis were of course the pigs and the way they decided to raise them. They are purebred fleshy Styrian pigs that are raised with respect and in conditions beyond anything you would expect in a pig farm. So when you step outside to start the tour and hear Mozart playing, you may be fooled into thinking what an interesting choice of background music to accompany a tour about quality ham. But the music is not there for our entertainment, believe it or not, it is for the pigs entertainment! And they appeared relaxed and happy. Some were going for a stroll in the wide space provided, above even the legal minimum requirements. To give them enough space to grow in a good environment the 2,000 pigs of Vulcano are spread among 4 farms. On a sunny day they also have cold showers available to refresh themselves and never get bored with the choice of classical music as it varies from day to day. Sometimes even pop music is played. Others seemed to be enjoying the warm, sunny weather like this mother with her piglets. You learn that in spite of being omnivores, pigs actually are quite picky. They have a fine nose and their forage can never be too bitter. 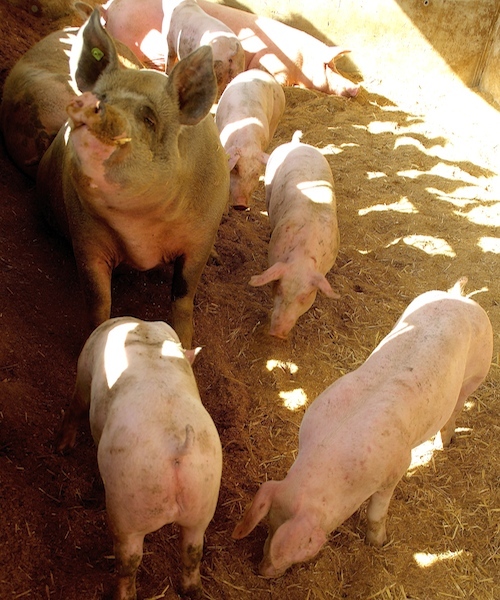 At Vulcano they pride themselves in providing the pigs with the best possible feeding according to the different age groups and the need of every pig. The menu is especially designed to contain a balance between proteins, mineral nutrients, lots of grain and a bit of corn. For better growth they are given wheat, corn and barley and for a tender and fine fat, rye. Usually when a pig is seven to eight months it reaches the ideal weight of 120 kg (265 lbs) but at the farm they are fed longer so that their meat and fat can increase in a natural way. 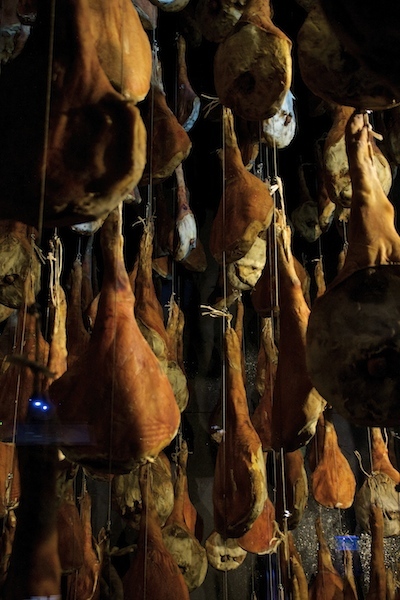 They believe a high quality cured meat needs time to mature. 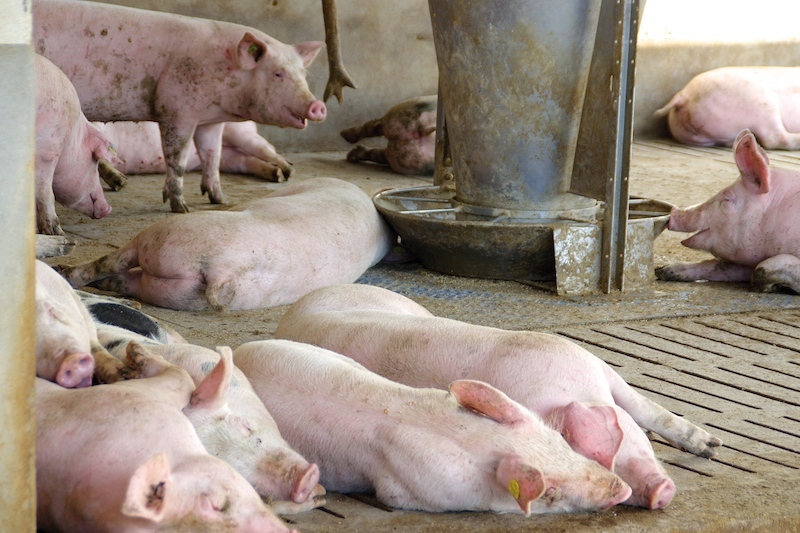 Once the pigs are ready for slaughter, care is put that it is done in a stress free environment. Only a very small amount of sea salt is used to dry the meat. This is done by hand. The idea is not to overpower the delicate taste of the meat. Then a mix of different herbs is added to give an extra, refined flavor. Rosemary, coriander, juniper and other herbs are used. Another characteristic of their hams is that the meat is matured at high temperatures between 18 -20ª C (64ª F – 68ªF) and a period between 27 to 36 months which is not very common. The longer the period, the more special and refined the flavour is. 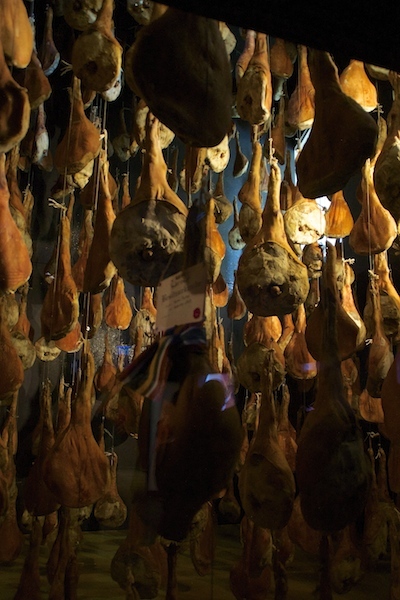 The drying hams are an impressive sight and if you pay close attention to some of the labels hanging you may even identify a European royal house or two, politicians and even fashion designers. There is only one thing left to do, it is of course to taste it! You receive a generous plate with a sample of some of their products which can be accompanied by a nice Styrian glass of wine. As I said in the beginning I do not consume a lot of pork, or meat for that matter. But I can appreciate quality and you can feel the refined taste along with the wonderful herbs. I am determined, like I did in Mexico, to find more about the culinary traditions this country has to offer. It is an important part of getting to know Austria. Above everything in this first leg of my culinary tour, I appreciate the way the animals are treated, the respect and the great care provided. Ham and classical music is no longer a surprise match. Only in Austria! Next stop in my culinary tour : Chocolate factory! Stay Tuned! Thank you Cecilia. I’m happy you liked it. Thank you so much Ado! Maria: Next time we will go to Austria we would like to go to Styria, to know that part of the beautiful Austria. As I said, even to be born a pig, one has to be lucky where to be born. I would like to try those hams. Dear Carmen, Pity you didn’t have so much time when you came but I hope next time we can show you Styria. It is a beautiful state. And yes, those are lucky pigs and the ham is really very special.